Sometimes the smallest inventions can have the biggest impact. For example, Google has put up a Doodle of a zipper today to honor Gideon Sundback. Sundback was an electrical engineer for Westinghouse Electric and Manufacturing Company after emigrating from Sweden in 1905, but a year later he found himself working at the Universal Fastener Company. There, he became the lead designer and eventually perfected the thing that holds our clothing together today. That’s right, Gideon Sundback invented the zipper in 1914. Amazingly, the idea for a system of locking teeth to serve as a fastener had been around for two decades before Sundback perfected the idea and filed the patent. Then again, if you can make an idea like that work, you deserve the credit. Sundback originally wanted the zipper to replace the hook-and-eye system used to fasten ladies’ boots, but eventually, the zipper would become THE clothing fastener of choice on everything from pants to mini-skirts and basically everything else people wear. 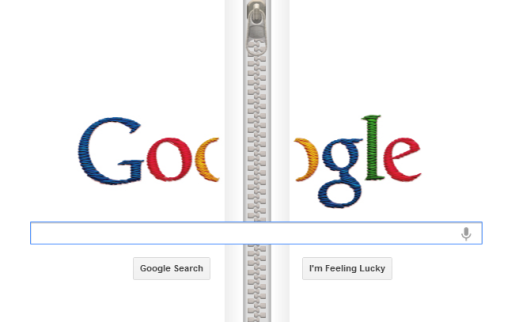 So go on over to Google’s homepage and play with their zipper a little bit today. It’s an HTML5 Doodle, so you’ll need a modern browser to handle that giant online fly, but I imagine you’re using that if you’re here. Just don’t get anything caught in those teeth!